Detail of German Arms 1888. Hired Transport Jack - for vessels hired for Cargo Works, etc. Other Royal Vessel Jacks - for vessels belonging to Department of Trade. The Second Reich Germany (1870-1918) was a strange federal monarchy. 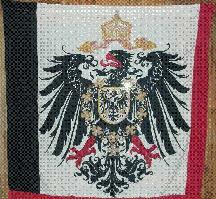 Over the course of the 19th century, the Kingdom of Prussia grew to become the most powerful of the various German states. After Prussian victory over France in 1870, its position was strong to declare a German Empire (Deutsches Reich) that included all of the German states outside of Austria-Hungary. The King of Prussia was also the German Emperor (Deutscher Kaiser); however, those other German states that had survived until 1870 as independent retained some of their former government structure, though subordinated to the overall Reich government. The monarchs of Saxony, Württemberg, and other monarchies retained their position and royal status. Even Republican city-states like Hamburg that were absorbed retained their Free and Hanseatic City designation, as they do to this day, although the monarchies were all abolished after the First World War. The schwarz-weiß-rot (black-white-red) German imperial flag was adopted by the North German Confederation in 1867, as a combination of the black-white of Prussia and the red-white of the Hanseatic League and/or of Brandenburg. In 1871 it was adopted as merchant flag for the German Empire, and in 1892 promoted to national flag. I am not sure as to an exact definition of the "national flag". It was used in an assortment of ways: at parliaments, schools and occasions where it represented the whole country - sort of like the Union Jack. On all of Germany, the national flags were 1848-1852 (more or less) black-red-gold. After c.1891, the black-white-red. Under the Weimar republic, black-red-gold, etc. Note that it was not quite either civil, state or war flag. I have tried to use the expression as a translation of Nationalflagge. Used "at parliaments, schools and occasions where it represented the whole country" - I guess that is what a civil flag is. With the establishment of the German Empire in 1871, the black-white-red flag of the North German League was maintained, Art. 55 of the Imperial Constitution of 16 April 1871 has the same reading as that of the North German League: "Die Flagge der Kriegs-und Handelsmarine ist schwarz-weiß-rot" (the flag of the navy and merchant fleet is black-white-red). Source: my series of contributions to FOTW on the flags of the German Empire of 1998, much material from the article I wrote with Rüdiger Dreyhaupt (Martin and Dreyhaupt 1999) and some other material. Illustrations (only major vexillological sources): Martin and Dreyhaupt 1999, no. 15; Crampton 1990, p. 42 (which is a copy of Meyers Konversationslexikon 1912, vol. 4, facing p. 799) no. 1; Znamierowski 1999, p. 48; Smith 1975, p. 121. The Iron Cross was a Prussian order first established by King Frederick William III on 10th March 1813 for military valour or patriotic service in the 1813-15 war against Napoleon. It was revived in 1871 for the Franco-Prussian war and in 1914 for the First World War. It was also revived as a German order in 1939 by Hitler. Except for the formal meaning, there is no official significance, although it may have been inspired to some degree by the cross of the Teutonic Knights which is superficially similar. Source: Alfred Znamierowski: "The World Encyclopedia of Flags, 1999." Like the Foreign Office state flag, but instead of the eagle a golden crowned anchor in the disc. Flown by naval vessels not entitled to fly the war ensign. Adopted 1893 and abandoned by 1921. Illustrated in Crampton 1990 p. 42 (which is a copy of Meyers Konversationslexikon 1912, vol. 4, facing p. 799) and National Geographic 1917 p. 367, no. 1000. The state ensign was adopted by the Bekanntmachung (decree) of 20 January 1893, which read "ratio 2:3, central white disk 5/9ths of height, the red is light Zinnoberrot (brick red or English red, today we might say vermillion), the yellow is dark (golden yellow)". It was possibly abolished in the Constitution of 11 August 1919, which only mentions Reichsfarben (national colours) and Handelsflagge (civil ensign). A new state ensign was introduced by the Verordnung (decree) of 11th April 1921, but as this decree also says that former flags could be used until 1 January 1922, it might be possible that the state ensign was in use until this date. Other National Administrative Branches (Übrige Verwaltungszweige des Reichs) flew a flag like the Foreign Office state flag, but instead of the eagle an Imperial crown in gold. Flown by government vessels not qualified to fly the [war] ensign or any of the Foreign Office ensigns. Adopted 1893 and abandoned by 1921. Illustrated in Crampton 1990 p. 42 (which is a copy of Meyers Konversationslexikon 1912, vol. 4, facing p. 799), National Geographic 1917 p. 367, no. 1010. An improved image of the State flag of Germany from 1893 - 1918. The image is dramatically improved by the finer details. I am trying to identify this flag, which I think is some type of Prussian Flag. It appears that someone has hand-sewn a red piece on the bottom of what was a black/white/red flag. Is this what is called a ‘crowned eagle’? This is one of the banners that decorated the lamp poles on one occasion only, and that was for the Coronation of Kaiser Wilhelm II, 1859-1941, Emperor of Germany and King of Prussia. He succeeded Fredrich I and this Coronation was in June of 1888. All streets of Berlin were decked out in such trapping. Wilhelm II was crowned 15 June 1888. The arms can also be found in Leonhardt's Das grosse Buch der Wappenkunst, 1978, p. 191 - Kaiserliches Wappen Wilhelms II. 1888-1918. The quartered small inescutcheon is from the Zollern Arms of 1248. The chain is from the Order of the Black Eagle. The floating crown is the Imperial Crown. Only the Emperor was allowed to use the eagle-escutcheon. The described flag is the so-called "Reichsadlerflagge" (Imperial eagle flag). A very famous flag used for decoration only. Not an official flag, anyone was allowed to use it. This is was not a Prussian flag, it's a German flag used between 1871 and 1918. You can find more information (if you read German) and pictures at my Eine frühe Variante der Reichskolonialflagge? (An early variant of the Imperial colonial flag?). Hired Transports, Vessels for Cargo Works etc. Other Royal Vessels belonging to Department of Trade. A further inscription infoms the reader that the badges should be placed "in the lower left hand canton." I presume that these are introduced in 1871 (with perhaps the exception of the Royal Mail Vessels ensign which is reported by Marcus Schmöger, who gives the date 1867). Presumably all these flags fell into dis-use in 1892 as no mention of them exists in the Admiralty flag book of 1907. The Naval Ensign was changed in 1892 when the eagle was replaced and it could just be the case here that all of these Public department ensigns and jacks were discontinued. for vessels hired for Cargo Works, etc. I found a similar flag in [sig12] flagchart 22 row 4 column 2, showing a Prussian eagle in the centre, an iron cross in the upper hoist and the four red crossed anchors in the lower hoist. It is underlined as Arbeiter Fahrzeuge p.p. der Marine 1863. Whatever that means, I believe it is a flag of non-combat vessels according to English terms probably denoted as "auxiliary vessels." In Hounsell's "Flags and signals of all Nations" published in 1873 the ensigns of the Public Departments are drawn, but the various devices that deface the lower left canton are shifted slightly toward the hoist as opposed to being centrally positioned within that real-estate. I do not know what the situation actually was for obvious reasons, but Album des Pavillons (1889) which was the French Naval Authority on contemporary Vexillological matters illustrated those defacements as such. The album proceeds to enlighten its audience that there were jacks for these departments, presumably flown from the front, but this raises a question: Where the ensigns are flown from the stern or would the flag that occupied that position have been the merchant vessels red-white-black, and if so, where would the defaced German ensign be situated? These are the Black-White-Red horizontal tricolours of Imperial Germany with the various devices on the middle of the white stripe.